I never heard of olive oil biscuits or cookies until I read an article recently! It was developed by Georgian food writer Damon Lee Fowler and it was told to be "not the tender, flaky texture of a traditional biscuit– but the smooth, silky (and healthier) biscuit you get instead is delicious and compelling." ♥ Pre-heat the oven to 500F. ♥ In a large mixing bowl, whisk together both flours, baking powder and salt. In small mixing bowl (another one), combine the olive oil with 2/3 cup of the buttermilk and stir until well-blended. ♥ Make a well in the center of the flour mixture, add in the olive oil mixture. Stir until the dough clumps together and pulls away from the sides of the bowl. Add the remaining buttermilk and stir until the dough is no longer crumbly. ♥ Transfer the dough to a lightly floured work surface, pat out 1/2 inch thick, fold in half and pat out again. Repeat folding and patting five or six times, then pat out 1/2 inch thick. Cut out rounds with a 2-inch biscuit cutter and arrange on a baking sheet about 1/2 inch apart. We don't want to waste here, gather up the scraps, fold the dough over itself three times, pat out 1/2 thick, and cut our more rounds. 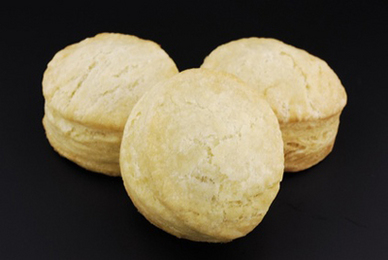 ♥ Bake in the center of the oven until the biscuits are golden brown- about 10 minutes. ♥ Source found that folding in a little extra sea salt, black pepper and some rosemary at the end makes them even better. Thank you so much Melissa Breyer from Care2! This is a great recipe to share, and it's healthy!